We love our pets for many reasons, including their loyalty and devotion to us. They are often happiest when standing faithfully by our side, and a little sad to see us leave home for any reason. However, some pets can suffer from stress and panic in the absence of their owners. This challenge is called separation anxiety, and it can be common in both cats and dogs. 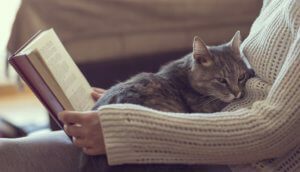 Dr. Jill Sackman, head of BluePearl’s behavioral medicine service, talks about the signs, causes and treatment of separation anxiety in cats and dogs. In cats, the most common sign of separation anxiety is urination on personal items with the owner’s scent (especially the owner’s bed). Other signs include defecation, excessive vocalization, destructiveness and excessive (psychogenic) grooming. Keep in mind some of these behaviors are common in other situations, such as boredom, physical illness or excessive energy in young puppies. Signs associated with separation anxiety are exhibited only in the physical absence of the owner. Older pets – in some cases, separation anxiety can develop or reappear with age. Pets with noise phobia – for example, if a dog is afraid of thunderstorms, he may be nervous to experience loud thunder and associate hearing those noises at some point when the owner is gone. Keep in mind social behaviors in dogs reflect their descent from wolves, which have a very structured society. Cohesion of the group or “pack” is critical to survival. Social attachments in dogs are what predispose them to experience separation-related emotions and behaviors. Behavioral training and changes in the home are two essential components in effectively treating separation anxiety. Consider the following tips to help relieve your pet’s separation anxiety. Take your dog to daycare or a friend’s home while you are away. And if you are allowed, consider taking your dog to work with you! 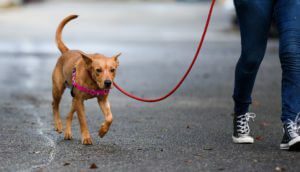 Add more exercise to your dog’s day, especially prior to being left alone. Exercise alone doesn’t cure anxiety, but being pleasantly tired reduces the intensity. Leave your dog a puzzle toy that contains food or a Kong-style toy filled with tasty treats and peanut butter. Not only will the toy occupy your dog’s time, but the chewing and happy experience of playing can calm your dog’s anxiety. This is best for dogs with mild or moderate separation anxiety, as dogs with severe anxiety may suffer from gastrointestinal upset. When done properly, crate training may be helpful for a dog with separation anxiety. Your dog will consider his crate a happy, comfortable place to hang out while you are away. This can also prevent destruction and potty accidents in your home. Click here for tips on how to crate train your puppy or dog. Set up a video camera in your home to monitor your dog’s behavior. While this does not have an effect on him, it can help you get a better idea of exactly how your dog reacts to you leaving the home. You can also monitor how well your pet is doing as you work on his behavioral training plan. Dogs can be very receptive to our habits and daily routines, so your pup may pick up on the things you do during your “getting ready to leave” routine, such as putting on shoes, grabbing your keys or blow-drying your hair. If this routine triggers anxiety in your pet, consider decoupling these items from your leaving. For example, perform these tasks then stay at home. Eliminating the association between your routine and separation can help avoid triggering your dog’s anxiety. Many dogs with separation anxiety may appear to be like “velcro” when following their owners around the home. Teaching your dog independent behaviors can help develop coping skills when you leave. This begins by giving your dog a task to do in another room. For example, give your dog a food-filled puzzle toy in the office, while you sit in the bedroom. After a few minutes, reunite with your dog. As training advances, leave him alone for longer and longer until he gradually becomes more comfortable with separation. The key to treating separation anxiety in cats is to give your kitty lots of enrichment. This can include putting meals in food dispensing toys so they can hunt, adding vertical space for climbing, providing multiple water sources and more. 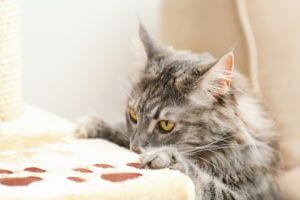 For tips and ideas about keeping your cat entertained and happy in the home, please visit our article on cat enrichment. There is no proven method of preventing separation anxiety from forming in pets. However, it is always a good idea to encourage your dog to develop independent behavior – such as playing with a toy in another room, or relaxing in a crate by himself. For cats, providing an enriching environment is essential. If you notice signs of separation anxiety in your pet, it’s important to talk to your veterinarian and try to fix it as early as possible to prevent it from worsening. “There is no exact formula or plan for prevention,” says Dr. Sackman. “The best thing to do is be sensitive and be aware of the signs of separation anxiety.” To learn about a separation anxiety case with a successful outcome, read Oreo’s story. For more information about separation anxiety and behavioral health, contact your primary veterinarian or a veterinary behaviorist.